Cabipool is a Real-time ride and travel plan sharing platform. Being Community and Ratings driven, Cabipool envisions changing the way an average Indian travels. Our Web portal and Mobile App will allow members to Car-share, Bike-share, find a Travel buddy and even locate nearby toilets in middle of a shared ride. And, yes! Did we forget to mention that all this will be in real time? Think beyond costly Cabs & Taxis. Come explore Cabipool – The next Generation Travelling & Ridesharing Community. Cabipool helps people share their costs instead of helping drivers make a profit, and the rides you take with us are way more fun and secure than other means of transportation, not to mention the comfort of a car or a bike and the fun of having company throughout the whole trip. Our complete focus is on safety, coordination, trust and mutually beneficial smooth cost sharing for vehicle owners and passengers. The idea to have a community of Ridesharers & Travel buddies is new to India. One of Cabipool’s primary goal is to bring about a social awareness that sharing a Car/Bike to optimum occupancy will help us to save the degrading environmental conditions. And, all this, while saving a lot of money on the regular expenses like transport, tolls, parking, holidays and many other travel related expenditures. With every Ride or feature you use, you will help in building a safer, cleaner and pollution free India. Join the revolution today! * Realtime Ridesharing: Get to know your co-traveller’s location on a Realtime basis through our permission based tracking algorithm. No hassles of unnecessary waiting times. * Ride Now: Planning a quick last minute ride? Use this feature to publish or search rides within next two hours. Only fast movers would be able to contact you. * Ride Later: Have time on hands until your next ride? Use this feature to publish or search rides after two hours from the current time. * Loo Stop: Stop worrying about Loo breaks while you travel. Use our Loo Stop feature to find the nearest Loo Stops around you. You can Rate & Review Loos too. * Travel Buddy: Don’t have a Bike or Car? Hate travelling alone? No worries. Find a Travel partner or share your travel plans with our Travel Buddy feature. * Chat: Want to be introduced before the ride? No issues, have a quick chat before booking the ride and finalize travel plans. * Tap to Call: Feel mobile chats are boring and lengthy? Call your co-traveler to know them better and finalize the ride as per your comfort level. * Cashless Payments: Do you prefer cards over cash? Go cashless with seamless and secure online payments. * Social Profile: Be a Ridesharing Star. Update your Social profile with Profile picture, Covers and let other members know what’s on your mind. * Ratings & Verified members: Travel only with trusted Ridesharers. Rate & Review your co-travellers after every ride to show your commitment for safe Ridesharing. * Preferences: Only travel with members with whom you can get along well. Find co-travellers that best suit your preferences (personality). You can set your own preferences too. * Ladies Only: Wish to make some interesting travel plans with a gang of girls? Choose ‘Ladies Only’ feature and enjoy time out with your new friends. * Support Center: Get all your doubts answered from our extensive Knowledgebase. Still have questions? Open a new ticket and we will get back in no time. * Dashboard: Your personalized Dashboard allows you to check, edit and add all the details about you. Be it your account, ride history, email alerts or even ratings; all at one place. 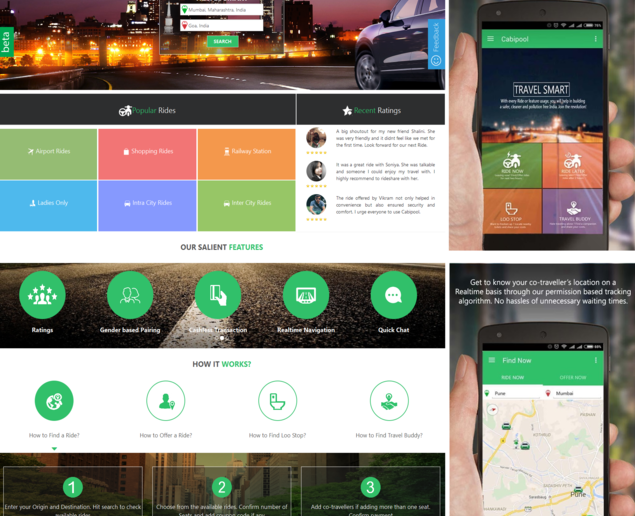 Cabipooo is India 1st innovative Real-time solution for sharing Loos, Travel plans & Rides!